Greasy Nuremberg sausage at 36 degrees celsius? Not a good, but an extremely tasteful idea. During the hottest summer in Germany I went on a culinary mission in the Franconian capitol of Nuremberg and fully hit the belly. 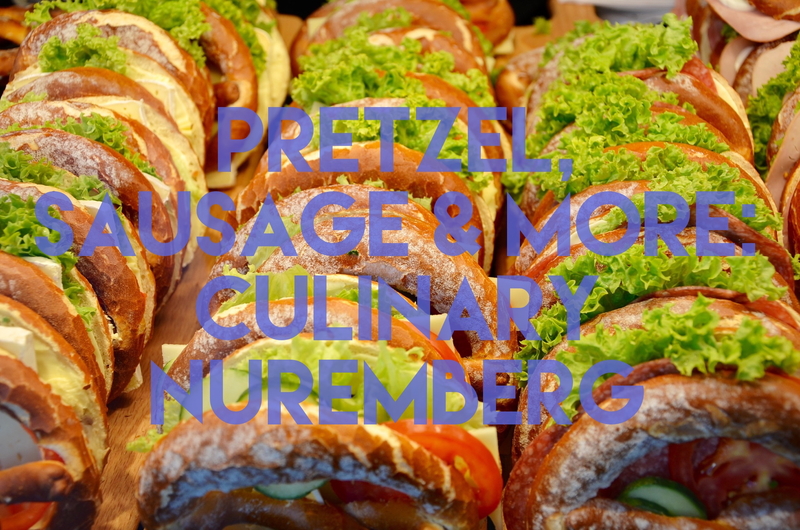 Here is my culinary guide to the best Nuremberg sausage and more. 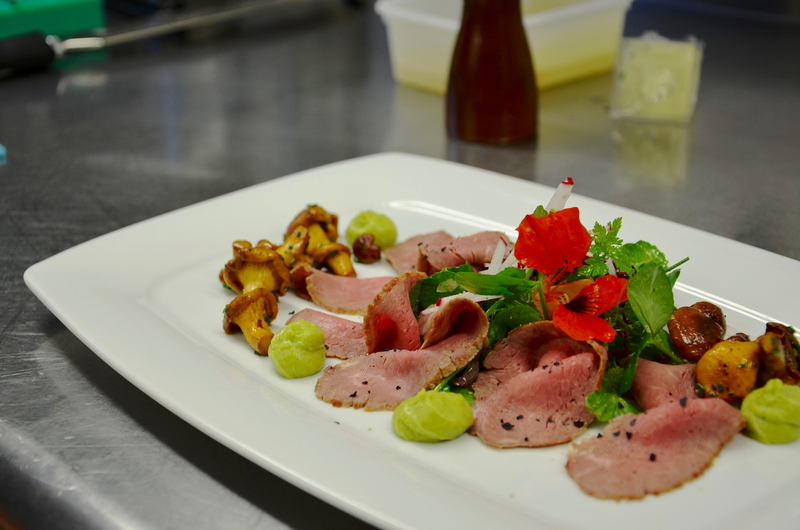 Check out the most amazing Nuremberg restaurants! When it comes to food in Nuremberg (or rather Nürnberg how we say in German), Nuremberg sausage or Nuremberg Bratwurst might be one of the most well-known dishes. Did you know that the Franconians (people fro the region of Franconia) call it “Drei im Weggla”? This which means three in a bun. Nuremberg sausage is quite simple: Just take a Weggla, which is a white bun, and put three small sausages into it. Then garnish the whole thing with mustard. Hint: don’t use ketchup, otherwise everyone will immediately know that you are a foreigner. There are many restaurants in Nuremberg that serve good Nuremberg sausage (or Nurnberger sausage or actually Nuremberg Bratwurst). The best might the so called Bratwursthäusle close to the main market. It’s so authentic, after your visit chances are good that you even smell like smoked and grilled Bratwurst yourself. 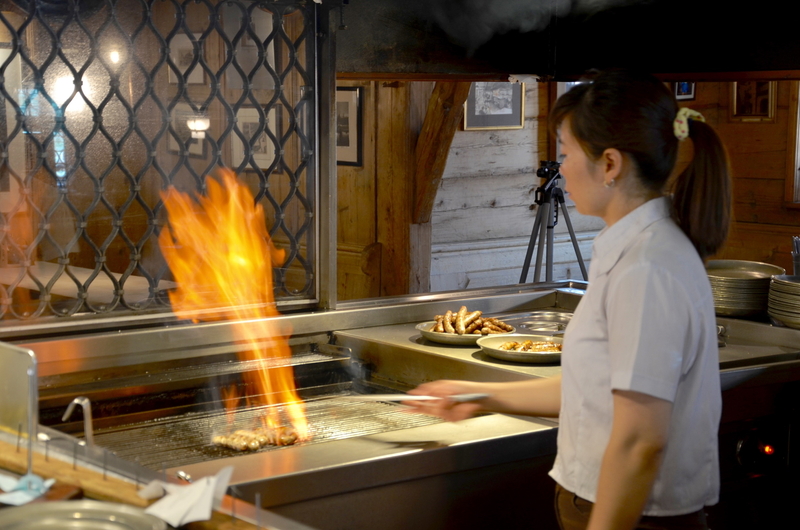 After all, their Nuremberg sausage is not only a home-made, but also grilled to perfection over a huge charcoal grill. Oh and by the way, more than three sausages are served on the plate. Another classic is the pretzel. Here in Franconia they call it Brezn. You can get on every corner, whether with or without butter, chives, cheese or what your heart desires. And believe me, the Franconian pretzel in Nuremberg tastes a hundred times better than the ones made by the big bakery chains in the rest of Germany. Brezen Kolb supplies half the region with pretzels. Others just come by during daytime or buy pretzels on Brezn Drive, the Pretzels Drive-In. Yes, read correctly. 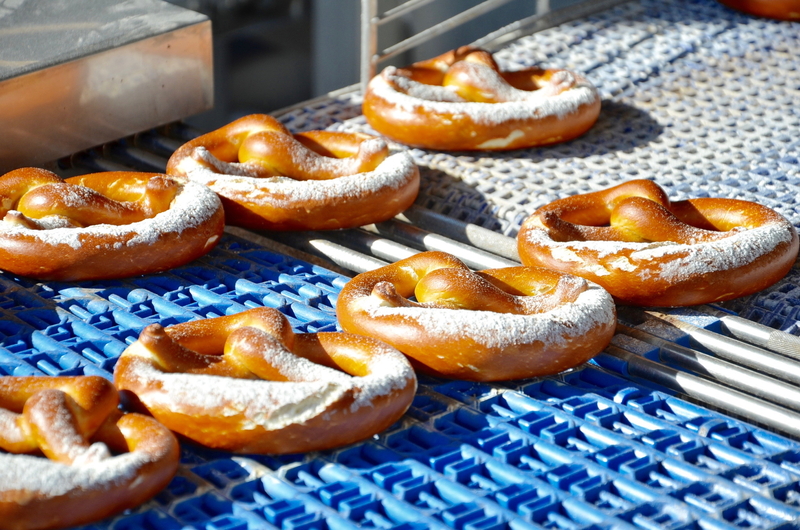 In Nuremberg there is probably the world’s first pretzel Drive-In. Just drive past to buy pretzels out of your car. Awesome idea, isn’t it? Another classic: Gingerbread. But where to get the best gingerbread in Nuremberg? That’s hard to say. The best thing is to eat your way through Old Town Nuremberg. If possible rather in colder months then in August. Otherwise the gingerbread might just melt in your hand. 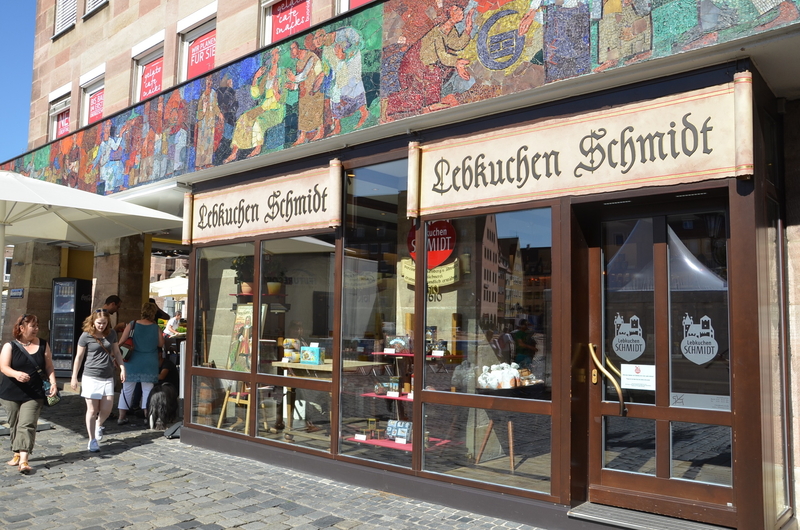 The most famous shop might be Lebkuchen Schmidt. Here you can’t do anything wrong. The hardest thing is to decide whether to take the one with dark chocolate, sugar on top or the ones left uncoated. 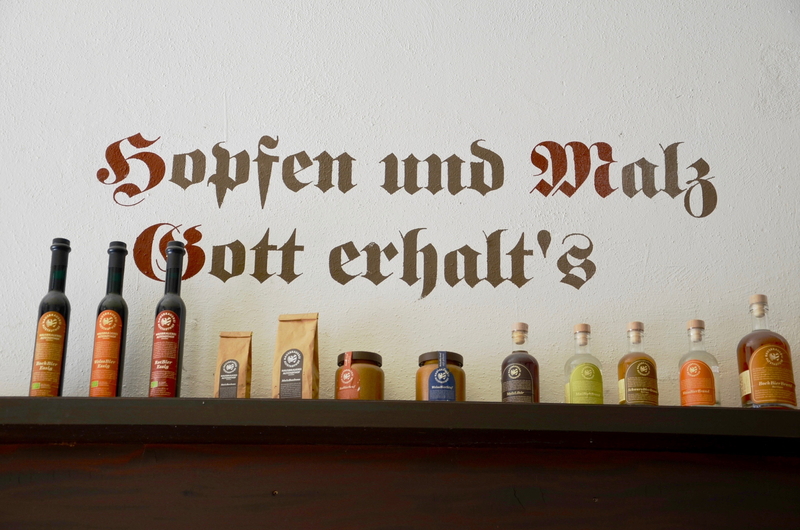 Whiskey from Nuremberg? Yes! I guess at some point it became boring for Franconians to brew beer so they came up with their own whiskey. Let’s see when they will outdo the Scots in terms of distilling, as they already have some proper brewery genes. 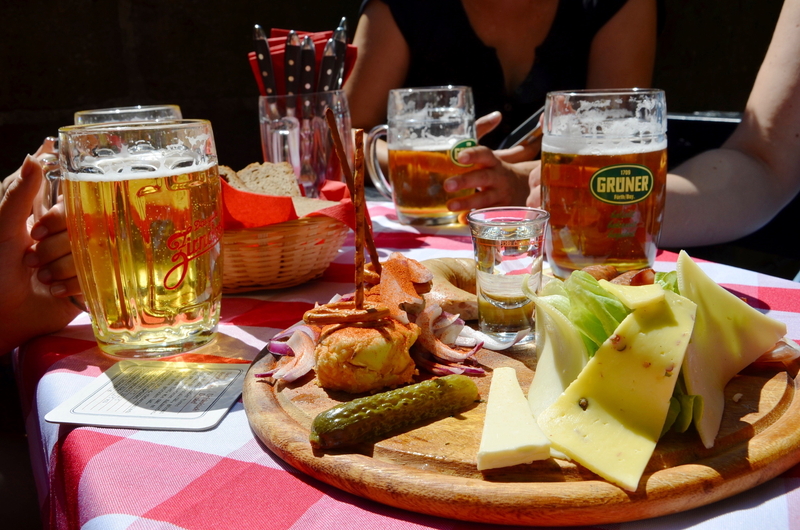 Here you can not only have a delicious meal, but even enjoy it with a beer from its own brewery. Or even better, join a tour through the breweries cellars. It is worth it. From rustic to modern. Because Franconian cuisine can as well be haute cuisine. At some restaurants they come up with Franconian classics in a modern interpretation served in a beautiful surrounding. The Zirbelstube is located in a quiet area just outside the city and surprises with an incredibly pleasant atmosphere. In a venue that is cozy not only in summer time, with a lovely summer garden and some extremely sympathetic hosts. The dishes are delicious. What is Schäufele? Schäufele is the pig’s shoulder meat that gives the dish its name, “Schäufele”. It needs to be roasted around three hours in the oven with bones and thick rind. In other words, its ready to be served when the meat almost melts in your mouth and the rind cracks. 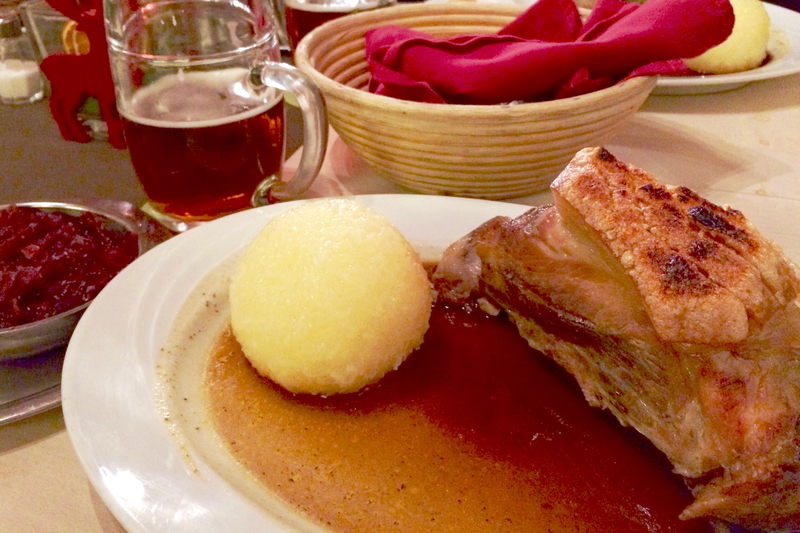 A Franconian dream of a meat dish. Many Nuremberg restaurants serve Schäufele. Probably the best I’ve eaten was at Steichele restaurant in December 2014. They have over 100 years of Franconian tradition and I immediately felt comfortable. In a place where they only speak Franconian dialect, where the dishes are to be eaten to the last dumpling and beer is still tasty, the Frankish world is still in order. And the Schäufele you get there? Simply Delicious! Nowadays there are Street Food Markets nearly in every bigger city. 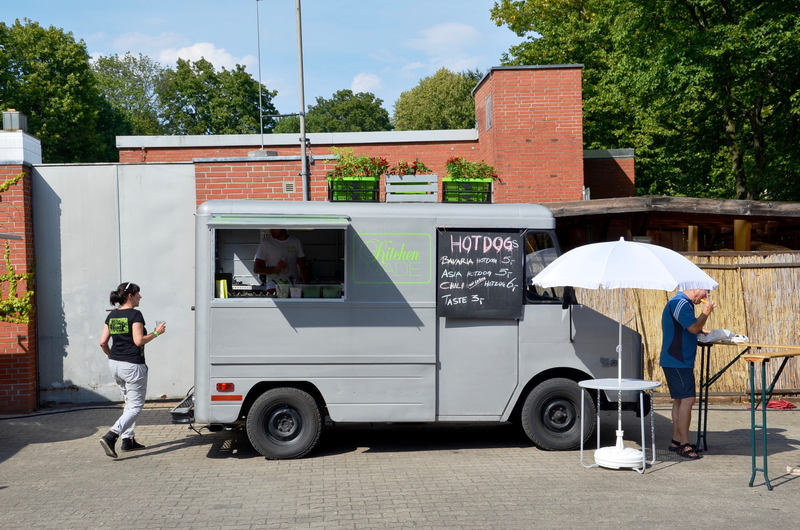 Although it is actually not necessary in Nuremberg with all its cozy parlors to have a meal on the street, this trend has also found its way to Franconia. And guess what, it’s totally worth a try. 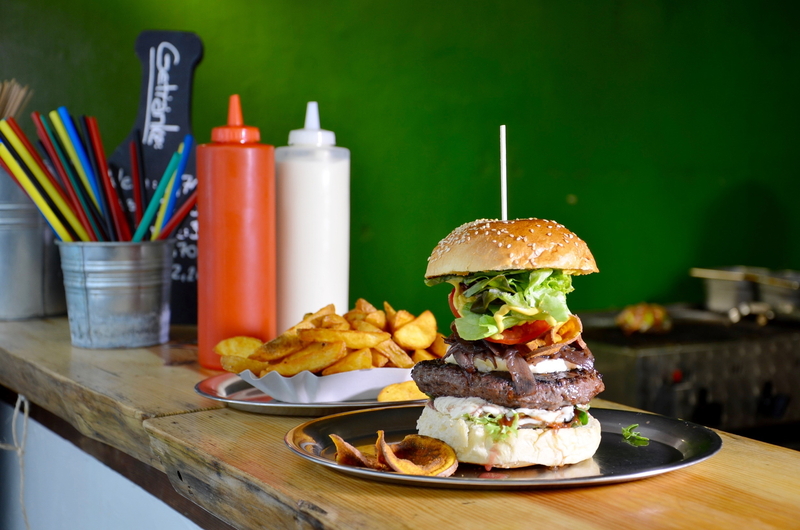 Talking about burgers: There are also hipster burger places in Nuremberg now. With good fries, meat and sauces. Alternative area of town, hip atmosphere, good burgers. Yummy! The best time of the day is Brotzeit. So have a try! To eat a hearty Schäufele at noon is surely not for everyone. Maybe that is why the Franconoans came up with the Brotzeit, or rather the Brotzeitplatte. This is nothing else than a huge snack plate full of small treat like pickles, sausages, cheeses, Obatzda (a piquant form of cheese preparation) and much more. Enjoy it in a shady spot with a good beer. Life is beautiful. An historic beer garden at the foot of Nuremberg Castle. Great views included! And after all these Schäufele and Nuremberg sausage? It’s beer ‘o clock. Speaking of beer: Frankconia has the highest density of breweries in the world. No wonder that every beer you get here is delicious. And as a German saying goes, 7 beer replace a meal. Cheers on that guys! When winter comes, it is usually freezing cold in Nuremberg. Well that’s why we have developed something long ago: the so-called Feuerzangenbowle. Named after the pliers on the vessel on which an in rum-soaked, burning sugarloaf is located. It warms from the inside and when the tank is close enough it also warms from the outside. Check out whats happening at christmas time in Nuremberg in my post about Christkindlesmarkt & more: Lose yourself in Nuremberg at Christmas time. The supposedly biggest but certainly tastiest Feuerzangenbowle can be found at the Fleischbrücke Bridge close to the Christkindlesmarket. A very good round-up to the region of Bavaria is the Lonely Planet Munich, Bavaria and the Black Forest. If you are about to spend more time in Deutschland, the Lonely Planet Germany and the Fodor’s Germany is a good deal. 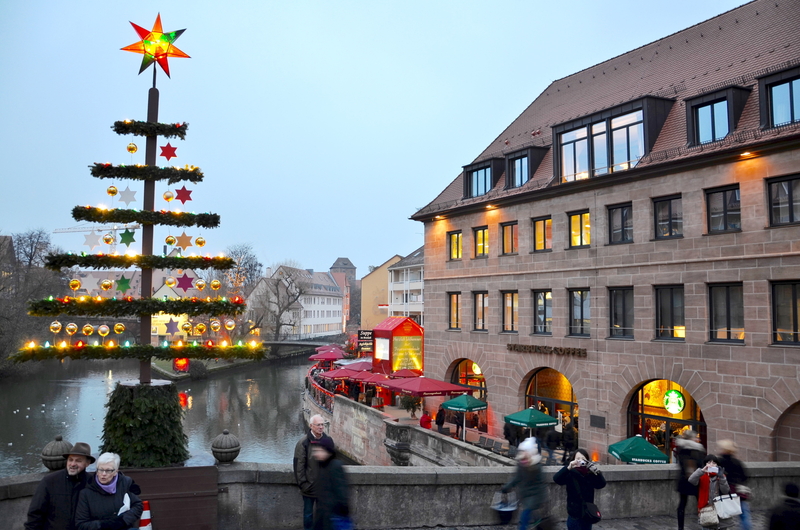 When it comes to best hotels in Nuremberg, I can absolutely recommend the newly renovated Sorat Hotel Saxx Nürnberg, that has the perfect location at Hauptmarkt, where in winter time Christkindlesmarkt takes place. Check the best rates on Booking.com. Anekdotique was a guest of Nuremberg Convention and Tourist Office. Thank you! All opinions, exaggerations and bad jokes are my own. 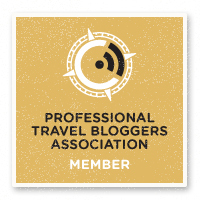 Clemens Sehi is the founder of the travel blogzine Anekdotique.com. He is based in Germany, is a freelance copywriter and a world traveler. Mostly because he travels since he was a little boy and still has the desire to do so. Probably forever. He traveled over 60 countries and just can’t stop exploring and telling you stories about it. So called 'Anekdotiques'. Have fun and travel along! I want to taste something from your pictures.!!! i looks delicious! I have been to visit Nuremberg once. I stayed at a small Inn right out side of the city. Walked up a little hill and right in to the city. Loved it!! Can’t recall name of Hotel? Ate a Brat house off to the side. My mom said it was the best one there though. This was back in 1987. Wow, that’s nearly 30 years ago! 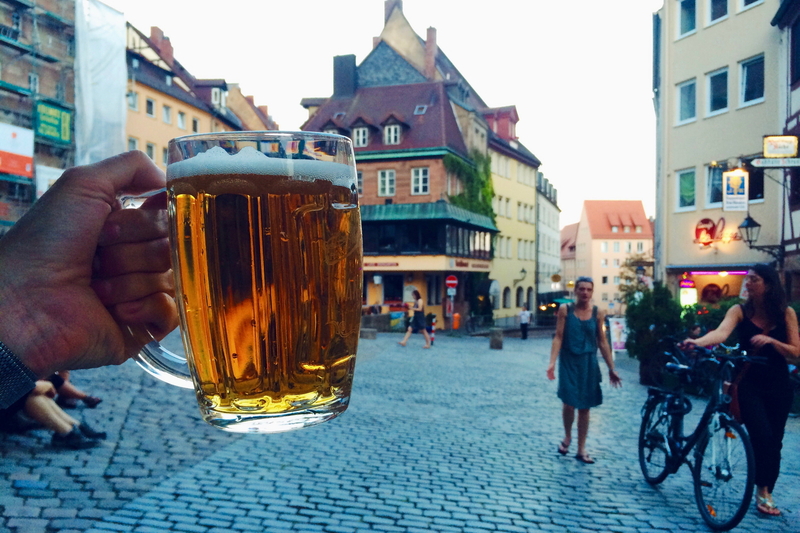 You should give Nuremberg another visit, it’s worth it. Ich muss auch bald wieder nach Nürnberg, Eva! Vielleicht schaffe ich es ja mal in den Steinegger Hof.